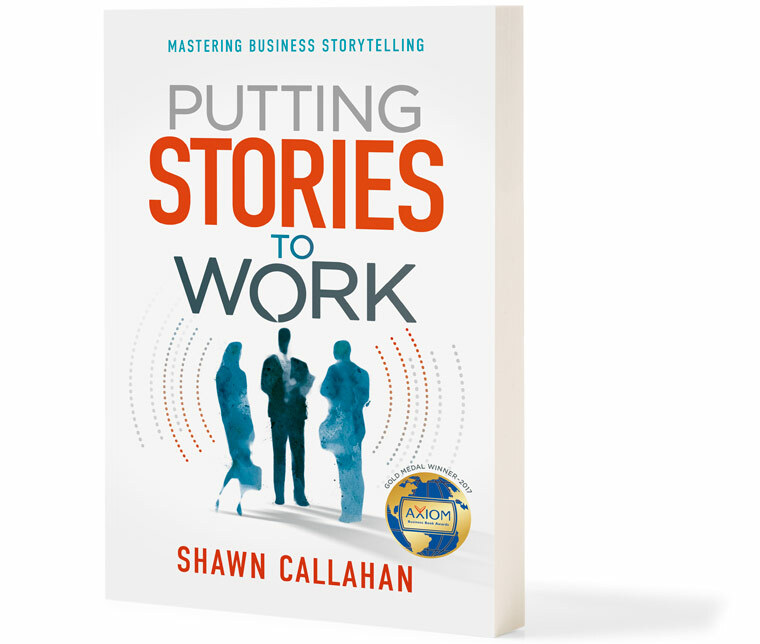 The award-winning business book by Shawn Callahan—Founder of Anecdote—about Mastering Business Storytelling. How to develop the habit of business storytelling to truly engage your audience and make your ideas stick. How to find effective stories to tell and how to remember them so they’ll pop to mind when you need them. When to retire a story and how to refresh it with one that will work for you again. When it’s best to tell a story and what type of story to tell. Also when not to tell a story. Available in Paperback or on Kindle from Amazon; as a Hardcover; or digital editions available in all good digital book stores from 20 March 2016. An enjoyable and practical gem. What a joy to read a book from which you learn so much. This is the best book on business storytelling. While other books tend to stay with concept, Shawn goes to detail that enriches the book as a practical ‘how to’ guide. And the book reveals so many nuggets—it could only be written by someone who for years has thought about and applied their subject. It was a compelling read and I was keen to find every opportunity to read more. Like on one particular day when I was about half-way through, I built my morning around having a late morning coffee and squeezing in another chapter. Well, I went to the local coffee shop and what should I find? My wife and her friend had planned to go to a different coffee shop for their catchup but it was closed so ended up to my surprise in the café I had snuck into. I was compelled to be sociable and chat to them and was denied my read of Putting Stories to Work! 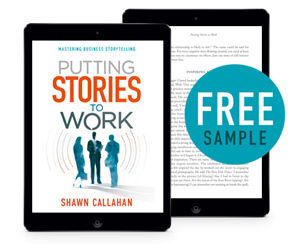 Download a free sample of Putting Stories to Work Introduction and Chapters 1-2. 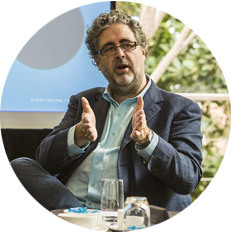 Shawn is the founder of Anecdote and one of the world’s leading business storytelling teachers and advisors. He started his career in technology with companies such as Oracle and IBM but realised, at the end of the day, it was the human factors that determined the success of any enterprise. In 2004 he founded Anecdote, a firm that helps leaders and sellers be better oral storytellers and corporations embed their strategies using stories. He helps Global 1,000 companies such as Shell, Danone, Microsoft and Bayer all around the world to influence, engage and inspire. He lives in Melbourne, Australia with his wife and two daughters. 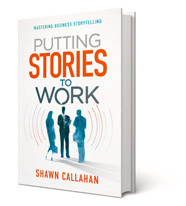 From Putting Stories to Work: Mastering Business Storytelling. By Shawn Callahan. I recently turned 50 and as a birthday present my younger brother Scott organised a road trip for the two of us along the coast of California. We spent the first week visiting many wineries between Napa and Santa Barbara, and sharing many stories. We then drove through LA and were just pulling into San Diego when we got onto the topic of goal setting, an activity to which Scott is dedicated. That’s when I dropped Dilbert cartoonist Scott Adams’ business-success bombshell, bluntly offering, ‘Of course, you realise goals are for losers’. My brother nearly fell out of the car. He couldn’t believe what I’d said. I had to explain that, despite Adams’ alarming phrasing, he was not just trying to be controversial. Rather, he was making the good point that unless you have a process for change, setting a goal is a waste of time. After calming my brother down, I got to thinking about all the books I’ve read on business storytelling. They all explain why storytelling is important. Many describe the types of stories you might tell. Some explain the characteristics of good stories and suggest ways to find them. A few even offer you stories to learn and share. Yet none really give you a process with which to build your business storytelling skills. That’s my aim in this book. There are many good business storytellers out there, such as Howard Schultz (Chairman and CEO of Starbucks), Indra Nooyi (Chairperson and CEO of PepsiCo) and Richard Branson (founder of Virgin Group), just to name a few. But outstanding business storytelling mostly takes place during unrecorded company off-sites, team meetings and informal catch-ups. I’ve always wondered how these leaders learned their storytelling skills. Was it because of their family culture, where they were immersed in storytelling from a young age, or did they pick it up from other leaders they’ve admired? Perhaps it was just the self-realisation that when they shared an experience, people tended to remember the point they were making. Steve Denning was spot-on when he called his seminal business storytelling book The Secret Language of Leadership because the leaders who inspire and engage using stories rarely share their secret. They see it as a differentiator. The vast majority of business leaders are not business storytellers. Sure, they share stories when they get together with family and friends. We all do. Storytelling is a very human condition. But when communicating in business, most leaders rely solely on reasoning, argument and logic to get their message across and to try and inspire action. If they have given storytelling any thought at all, they are usually of the misguided view that sharing a real-life experience is a waste of time?—?it’s not business-like. (We will show in Chapter 1 why that’s untrue.) The majority of business leaders, however, haven’t even considered the power of storytelling. They haven’t realised why some of their peers are engaging communicators and others are not. The leaders who do tell stories have developed a process for improving their storytelling and finding good stories to tell?—?whether they know it or not. It’s a process that will have evolved naturally over time. Yet leaders today who must engage and inspire their people don’t have the time to take such an ad-hoc approach, hoping to stumble across an effective way of learning business storytelling skills. They need an explicit, streamlined approach to business storytelling. In my work with Anecdote, I have helped develop such a process. ***I wandered into business storytelling in the late 1990s. At the time I was working in IBM’s Canberra office, helping clients manage their knowledge, especially the things people knew but couldn’t set down in words; for example, knowing when to move from the design phase to the build phase, or knowing how to close a large and complex sale, or knowing where to find the next productive oil well. To prepare for this job, when I arrived at Big Blue, one of the first things I did was map out who were the experts in the field of knowledge management inside the company?—?no small task, as at that point IBM had over 300,000 employees, spread across just about every country on the planet. During my search I heard about Dave Snowden, who was based in the United Kingdom. He was involved in IBM’s recently founded Institute for Knowledge Management and I was told he was an entertaining speaker. So I sent him an email asking whether he had any videos of himself talking about knowledge management that I could share with my customers. He said he could do better than that and explained that he would soon be coming to Australia: ‘Why don’t you set up a seminar and I’ll come and present our latest thinking’. I thought that sounded great, so I invited 100 or so customers to a function room in Old Parliament House to hear the talk. Dave flew into Canberra just in time for the seminar; I picked him up from the airport and drove him straight to the venue. He was still wearing his tracky daks, but he told me he had a special travelling suit in his case that never needed ironing and he slipped into this at the back of the room. When I asked Dave whether he’d like me to set up his computer, he looked at me as if I was mad and just asked for a whiteboard. I thought to myself: This is a day-long presentation. How is he going to keep people engaged? When all of my guests had settled in and Dave started speaking, his method quickly became clear to me. He would tell a story, usually about something that had happened to him, and then he would use that story to make a point related to the field of knowledge management. I remember one of Dave’s stories that day was about a near mishap he’d had while walking to an opera in his tux in New York. He got a map at his hotel, found the opera house on it, worked out that he could easily walk there, and then set off on foot. As it turned out, his route wasn’t that safe for a lone walker, especially one in a tux. Some police officers pulled up beside him in their car to ask him what on Earth he was doing and they ended up giving him a lift to the opera. Having finished this story, Dave then pointed out that the map is not the territory, that not all of the important knowledge will always be written down for a novice to follow. Dave wrapped up this idea with an aphorism: ‘You know more than you can say, and you will say more than you can write down’. From where I was sitting at the back of the room, I noticed how everyone in the audience was hanging off each word Dave was saying. They loved his stories and they loved his insights. The seminar flew by. It was a tremendous success. The impact of Dave’s performance on his audience got me thinking: I wanted to do that. So that night I wrote a story about a project I was working on and sent it to Dave for his opinion. When we next caught up, he told me: ‘You sure got that story written quickly. But you know what? You totally missed the point. I’m more interested in the oral stories told in organisations than in writing stories down’. To him, it was the oral stories that were truly important. Soon afterwards, Dave started a new IBM research endeavour called the Cynefin Centre for Organisational Complexity, and I joined it to look after Australian and New Zealand projects. Our work involved a sort of corporate anthropology: we would collect stories across an organisation and then help it develop culture-change initiatives. In 2004 I jumped out of IBM and started Anecdote. At first we continued the corporate anthropology projects, but soon our client organisations began asking us to help their leaders to become better storytellers. They would say: ‘You guys really understand stories. Can you help our leaders use stories to get their messages to stick?’ Initially we said no because we were worried that the powerful technique of storytelling might be used by some to manipulate employees rather than engage and inspire them. But under unrelenting pressure, we eventually agreed that we would help our customers with storytelling as long as the stories were not fabricated and the emphasis was on helping leaders to find and share their own real-life anecdotes. We quickly discovered that to be an effective storyteller, you need a robust process. First, you need to discover good stories to tell. Then you need to organise these stories so you can remember them promptly?—?there is nothing better than being equipped with a relevant story to tell off the cuff. Then you need to share the story in a way that has impact. And finally, a good business storyteller knows when to refresh or retire their stories. It is through this process that Anecdote has helped thousands of leaders across the globe become better communicators using oral stories. 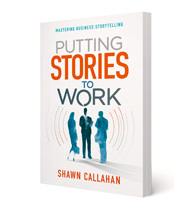 At its heart, this book is a process for becoming a good business storyteller. Part 1 explains the foundations of this skill. It will help you understand why you should care about business storytelling, before taking a look at the fascinating nature of oral stories and explaining how being a business storyteller is best thought of as a habit to be developed. Part 2 takes you through the story mastery process of Discover, Remember, Share and Refresh. Part 3 takes a company-wide view and shows you what it takes to embed business storytelling in an organisation in a systematic and purposeful way. Throughout this book, I talk about business leaders. I use the term leader in its broadest sense. If just one person looks to you for leadership, then you’re a leader. You can lead as a front-line employee, a CEO, or in any role in-between. Leadership can be performed by anyone, anywhere in an organisation, because it’s not merely about a title?—?it’s about an attitude and the actions you take. I’ve tried to provide a clear rationale for any assertions as well as pointers to the relevant scientific research, favouring data from scientific experiments over expert opinions. But while research provides the foundation of the ideas in this book, the emphasis is on practice. It’s vitally important to try things out in a business environment. There is no better way to build the skill of business storytelling than to tell stories at work and learn from the experience. This book uses a ratio of about one part storytelling to three parts reason, argument and logic, which is roughly the amount of storytelling you should be aiming for when communicating with your people. Every time you find yourself giving an opinion, start looking for an example (a story) to back it up and bring it to life. You will notice that my stories range from personal anecdotes to stories about scientific experiments to lessons from business and everything in-between. Any story can be a business story as long as it has a business point. At the back of this book is a story index where I have listed all the stories told in this book. I’m sure you will find yourself retelling many to good effect. 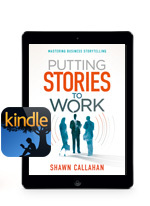 This book is intended to be a practical guide to how to develop and maintain your business storytelling skills. I’m also hoping you’ll be able to draw on the research provided to support the case for storytelling in your own organisation, satisfying those who are looking for evidence that storytelling works. Needless to say, it’s much better to tell the story of this research than to merely list the facts. Up until the 1990s, leaders could get a lot of work done by wielding the authority and power to command people to act. And they did. But the internet changed all that. It allowed us to connect with others in ways that bypassed the formal hierarchies, and work sped up. At the same time, gen Xers and millennials developed a more collaborative ethic: work got done because of who you could inspire and persuade to make a difference. In this new world, business storytelling has become the essential communication skill. Smart organisations are investing in helping their people to systematically and purposefully find and share effective stories. Let me show you how.